Welcome to the 2019 LLBFL Cheerleading Program. We look forward to a fun and rewarding season. The following information will be of importance to you and your child. We have included some information to hopefully make this an enjoyable and fun season for your entire family! Our 2019 season kicks off August 24th 2019. ONLINE REGISTRATION – Online registration will be available through our website at www.LLBFL.org beginning March 1, 2019 or when the league has reached its maximum capacity. GAME- Each team will be at the games scheduled by the league, cheerleaders are required to be there 1 hour before their game for warm ups and preparation. FUNDRAISER- In order to keep our registration prices low, we ask that all our cheerleaders participate in our fundraiser. If you do not want to participate in the fundraiser, you can opt-out by paying the additional $120 fee at the time of registration. UNIFORMS - The uniform will consist of: Vest, skirt, bloomers, pom poms. Note: In addition with the registration fee, the league will collect a deposit of $100 (paid by check only) when you pick up your uniform. In order to receive your deposit at the end of the season, please handle your uniforms with care and return them back in the condition it was given to you. All practices will be held at Bill Allen field located in Sterling, VA. The Cheer coach will notify you as to which days of the week you will be practicing. Each cheerleader will be required to attend all practices and games at the scheduled times unless your child is sick or is attending a religious class or seminar. Please keep in mind if your cheerleader has summer plans during our cheer program season, please evaluate your time based on the leagues requirement to be present at all practices and games. Failure to show up to practice will result in your cheerleader being benched during games. Failure to show up to games will result in suspension. TRANSPORTATION – Each parent and/or guardian will be responsible for providing transportation to and from all practices and games. If you are unable to transport your cheerleader to practice and/or games, please contact another parent on the team or the coach. VOLUNTEERS- We are a volunteer run league and we need each family to help out during the season. Your coach will let you know when your team is signed up to work. If you can not or choose not to volunteer, you can opt out by paying $200 at registration in addition to your program fee. Thank you for your interest on our program. 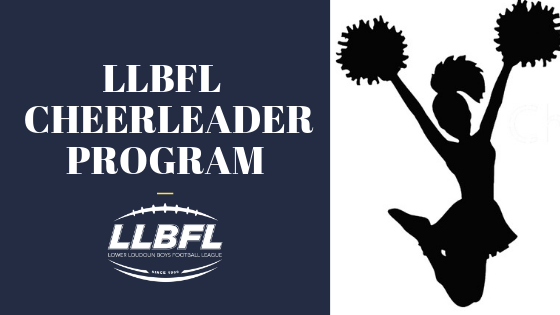 If you have any more questions about the cheer program, please email our Cheer Coordinator, C'ly Peterson at info@llbfl.org.